Lutoslawski was born in 1913 in Warsaw. He studied mathematics for several semesters at the University of Warsaw and, at the same time received, a thorough musical education including piano, violin and composition at the Warsaw Conservatory. There, one of his most important mentors was Witold Maliszewski, a pupil of Rimsky-Korsakov. In the thirties and forties Lutoslawski worked primarily as a pianist. After the war he worked for a time in the music department of Radio Warsaw. From 1952 onward he appeared increasingly as a conductor for his own compositions. He taught composition as a guest professor in the USA, Sweden, Denmark, and the Federal Republic of Germany. For many years he served on the board of directors of the International Society for New Music and was an original member of the Program Committee of the international renowned Warsaw Autumn, an avant-garde festival founded in 1956. The political changes in 1956, which helped spur to the formation of a new, independent art movement in Poland, also had marked influences on Lutoslawski's work. After folkloric and neoclassical beginnings, an involuntary detour during the occupation, the war years, and finally the Stalin era, he began composing for the first time according to his own ideas, desires, longings and ambitions. Since the end of the fifties he has been considered the spokesman of the Polish and European avant-garde scene and at the same time as a "classic among modern" composers. Chain II Lutoslawski chose the word "chain" to describe a principle of composition, which he discovered in the eighties. "For the last few years I have been working on a new musical form, in which two independent layers are put together. The sections inside these layers begin and end at different times. This is why the name "Chain" was chosen." It is a technique, which allows differently formed sections in the violin and orchestra parts to work together in Chain II. This dialog for violin and orchestra is a work commissioned by Paul Sacher, who co-conducted the premiere performance with me on January 31, 1986 in Zurich. The piece has four movements beginning with an ad libitum section. The violin begins alone almost in the same cadence. The second section, a battuta, is in the form of a toccata which is a strong contrast to the more lyrical beginning. Particularly moving for me is the entangled ending, which reminds me of a passage from Don Quixote by Richard Strauss, namely Don Quixote’s death. The slow ad libitum section is wonderful because the violin can express itself to the fullest. Also, it becomes very clear that one has more time for interpretation, because the conductor and soloist can decide when a new section should begin. The fourth movement has the character of finality. It concludes after a short ad libitum in a furious finale. Witold Lutoslawski on Chain II: "I composed the first version of the partita for violin and piano as a work commissioned by the St. Paul Chamber Orchestra for Pinchas Zukerman and Marc Neikrug. It was performed for the first time by these artists in January, 1985, at a concert featuring my works and at which I conducted. 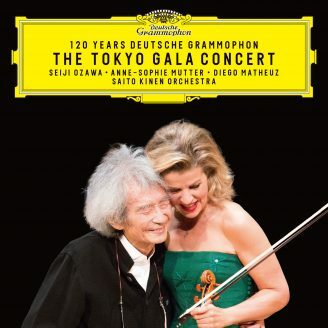 The new version for violin and orchestra (and piano obligato), which is presented in this version, was expressly written for Anne-Sophie Mutter and is also dedicated to her. I created this new version following the very strong impression that Anne-Sophie Mutter's performances of my Chain II left on me. Her extraordinary talent truly inspired my compositional efforts, and I hope to be able to write even more for her.